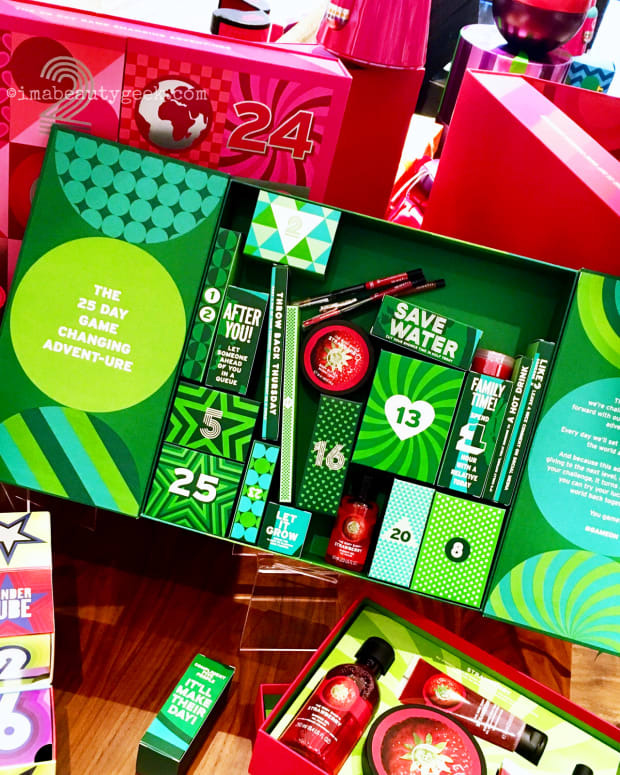 In addition to notable beauty deals both Canadians and Americans can access, some include free cross-border shipping for Canadians. If the recent Sephora sale hasn&apos;t already put your wallet in a coma, Black Friday is here to get you that much closer to finishing the job. *grin* At least, that&apos;s how it feels to me. I shouldn&apos;t even be looking for links to put in a post – it&apos;s wallet-risky behaviour! But there are some key spots to visit for great Black Friday beauty deals, so happy shopping! 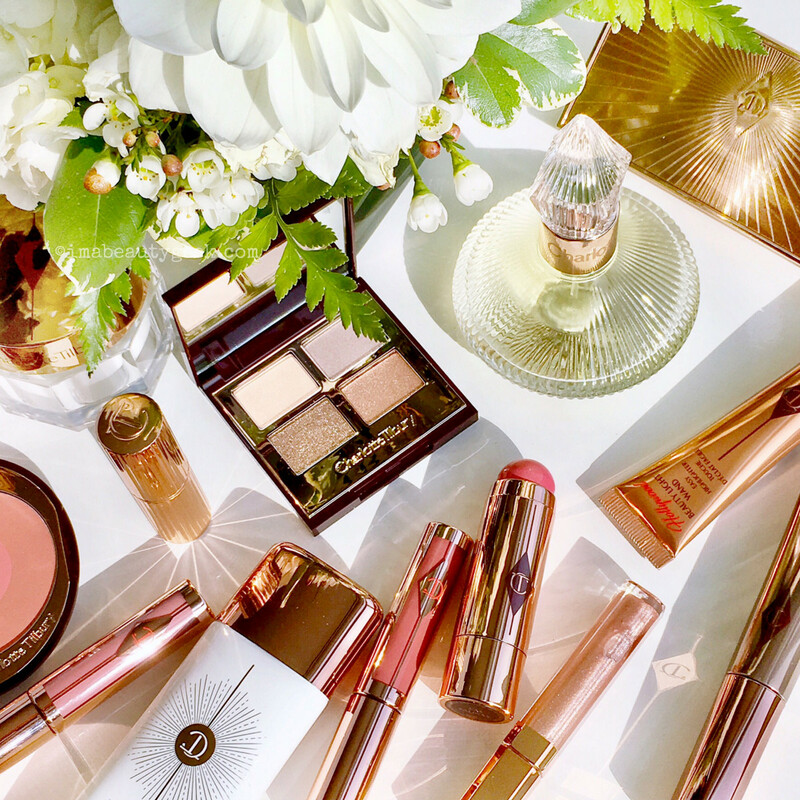 I&apos;m not obsessed with Charlotte Tilbury stuff at all. Nope, not me (#lies). But if you are, there are different Black Friday deals each day until Monday at charlottetilbury.com. Last year&apos;s Deciem Black Friday was apparently nuts. I didn&apos;t hit the site until Cyber Monday and that $1 bottle of The Ordinary Hyaluronic Acid 2% + B5. 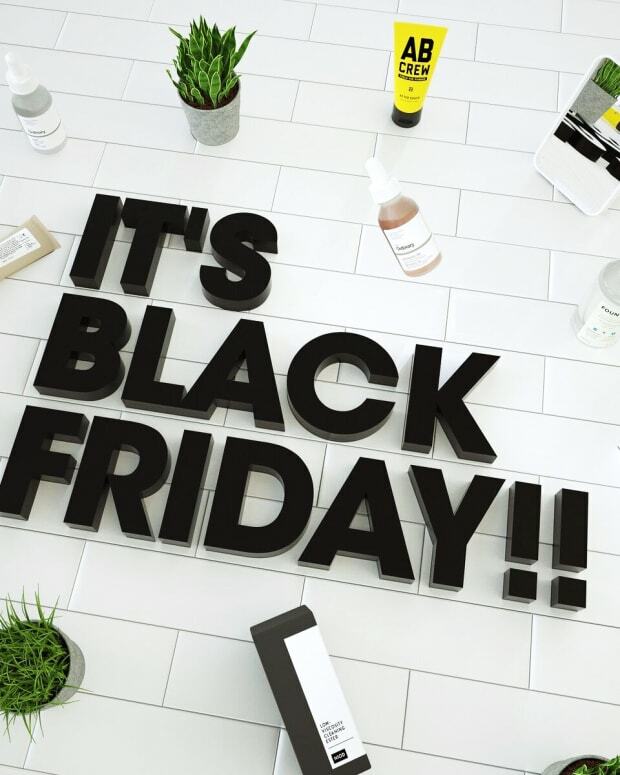 Note: Deciem ships to the USA, EU, Australia and Canada and is charging flat-fee shipping for any order that includes a Black Friday set. Also: don&apos;t despair if the set you want is sold out right now; you can still order most of them for a little while longer. Right now, Deciem is offering deep discounts on skincare sets such as the one in the above image, a variety of items from the Hylamide line. 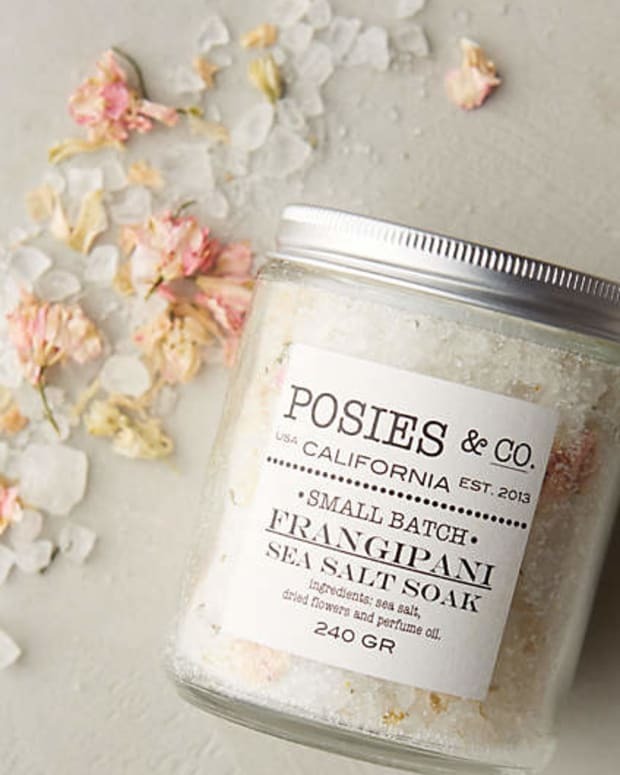 Of these I&apos;ve used only the Sub-Q Anti-Age, which my skin really liked – and I gave it away to a friend who had never used a hydrating serum nor anything with peptides on her oil-prone dehydrated complexion. That serum alone is $38 CAD; this collection of four items is a total of $43 and includes a tube of HA Blur ($19), a silicone-free, hyaluronic-acid-loaded blur formula that makes me want to buy the set myself, dang-it! #itsinthebasketalready. The High Efficiency Face Cleanser ($21) sounds interesting, as does the Sub-Q Eye serum ($35)... aaargh! USA/Canada shipping is $4.95; regularly priced items have to be in a separate order. Also note: you can make use of the Live-Chat option to consult with a Deciem expert prior to purchase – sets are not exchangeable nor returnable. I failed you all in not reminding you to put Dermarché Labs Roloxin Lift on your Sephora-sale lists! They aren&apos;t included in any of Sephora&apos;s Black Friday sets or deals, so I&apos;ll point you instead directly to dermarche.com for the brand&apos;s Buy 1, Get 1 on all products, plus free shipping in the USA – yeah, sorry my Canadian compadres, this is a note for our US-based pals! Also worth mentioning: most of the links in this post are affiliates, but this one is not. Glossier is offering 20% off everything plus free shipping, even to Canada. My favourites are still the Cloud Paint blushes. Luxury skincare brand Omorovicza – our Liza Herz geeked out over their lifting facial – is offering 30% off all their products online until the 28th. The Queen of Hungary Mist is so lovely, and the Thermal Cleansing Balm is a brand fave. Canadian beauty shopping site Scarlet & Julia unfortunately ships only in Canada. 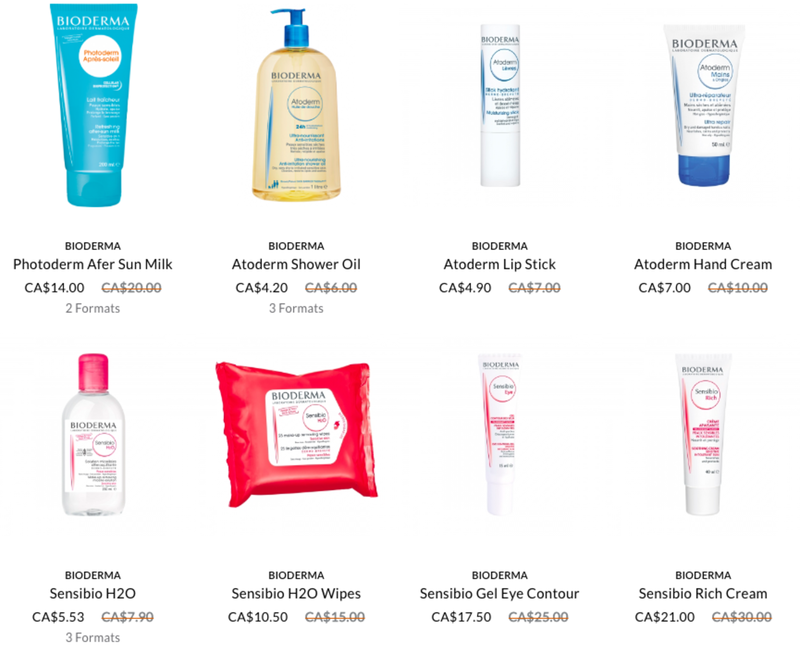 So the 30% off Bioderma and Institute Esthederm, plus an additional site-wide discount of 20% is of benefit only to us in the Great White North. But I wanted to mention it anyway because the sale is a good one. One of my faves is in the above image: Bioderma Atoderm Shower Oil is uh-maaaaazing. It cleanses gently without stripping skin and has only the tiniest bit of scent, very deliberately. Bioderma Atoderm Intensive Balm is another favourite – these two formulas used in conjunction can really make a difference to chronically dry and eczema-prone skin. The links in this section, btw, are also not affiliate links. Sephora, of course, is still a danger – have you seen the $15-or-less deals? 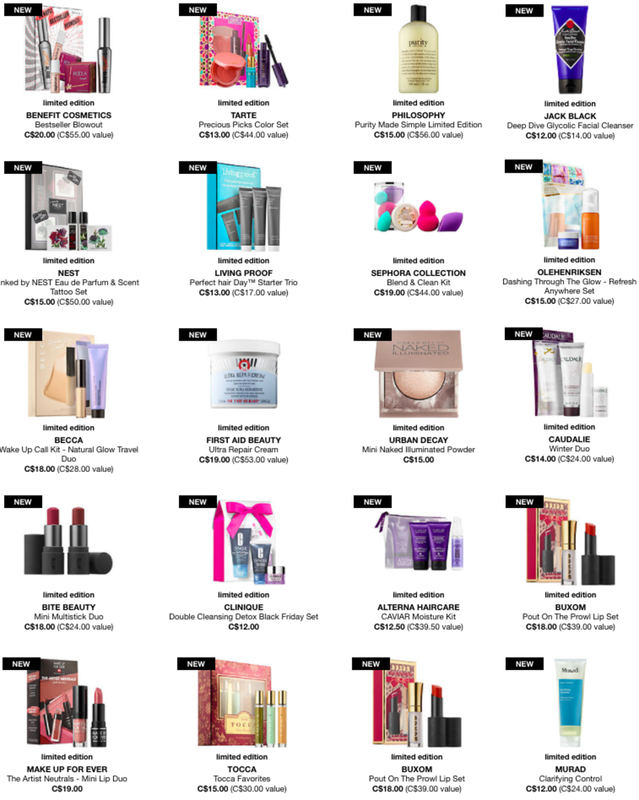 The image below is what&apos;s on offer on the Canadian side of sephora.com – US offers (you get $10 deals we don&apos;t) is below that. Also obvious: there are way more promotions than that, but when your wallet&apos;s feeling squeezed, you start at the lowest priced sale items and move up, right? Right?? Sure, I&apos;m bummed at how many more items are in the US deals section, but that&apos;s mitigated by my wallet&apos;s extreme relief in my having less from which to choose. Canadians considering shopping online from Ulta, Saks and Nordstrom will get a break this weekend, as per the above image. This is via an outfit called Borderfree. Also Canada-only are Black Friday sales at Hudson&apos;s Bay. I almost didn&apos;t include them though because they&apos;re offering only 10% off beauty (excluding Dyson and Hermes) with the code BEAUTY at checkout. But in other departments, discounts are going as deep as 70% off, and shipping is free, no minimum purchase. There are many more retailers I could include, but honestly, this stuff fatigues my brain. So tell me: how many sites do you usually visit for Black Friday/Cyber Monday savings?